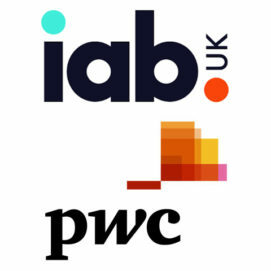 IAB UK announced Wednesday (10 October) that UK advertisers spent £6.4bn on digital advertising in the first half of 2018, according to the latest results of the IAB UK and PwC Digital AdSpend report. 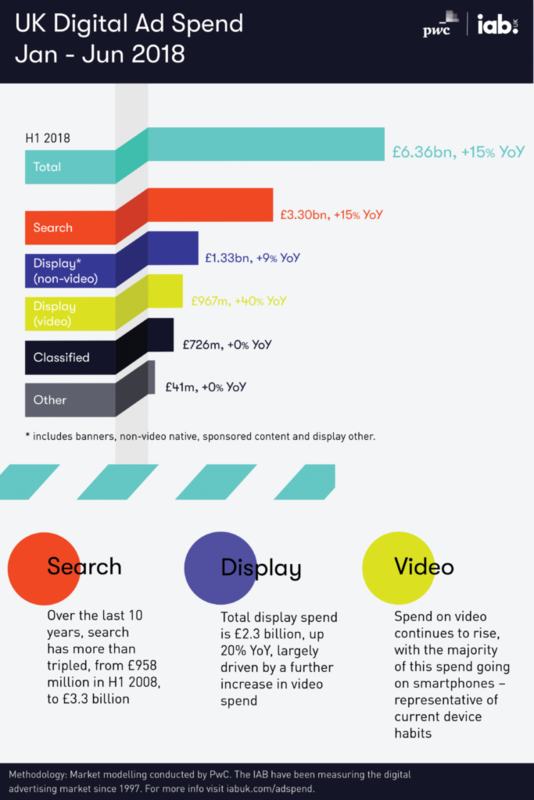 Search has grown 15% to £3.3bn, commanding 52% of total digital ad spend, whilst classified remained flat at £726m. With the maturation of the market, the half-year figures are now reported for combined mobile and desktop ad spend and the methodology has been updated accordingly. The 2018 full-year report, due for publication in April 2019, will continue to provide a detailed analysis of formats and spends. Effective creative optimisation is one of the major untapped opportunities left for advertisers, according to results of a new report from Flashtalking, the leading global independent platform for ad management, data activation, and unified insights. In its analysis of 60 campaigns, comprising 10 billion individual impressions, Flashtalking established that, on average, the top performing quartile of creative is 7x more impactful than the worst-performing quartile, and that click-through rates are negatively correlated with creative performance. These findings make it clear that the quality of advertising creative has a dominant impact on campaign performance and return on ad spend. To bring clarity to the creative measurement problem, Flashtalking developed a methodology to assess creative performance in a way that would better serve advertisers’ needs. Employing an algorithmic, machine-learning-based approach, Flashtalking assessed the performance of each creative version – defined by its propensity to influence conversions in proportion to the total number of impressions served – across 60+ campaigns from 2018 comprising over 10 billion impressions served on behalf of 24 advertisers, covering the Travel, Media, Telco, Gaming, Consumer Services, and Energy sectors. Flashtalking’s proprietary, data-driven approach employs clustering algorithms to account for bias from audience and media factors, and machine learning multitouch attribution to determine the effectiveness of each creative. 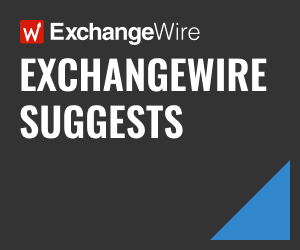 mediasmart has partnered with the native advertising exchange TripleLift, to offer enhanced image formats and instant play video through TripleLift’s native advertising offering. Native advertising has evolved from an industry buzzword into an effective marketing strategy used by many of the world’s largest brands and agencies. The partnership offers mediasmart customers access to a new source of integration for content marketing, advertorials, sponsored content, and any other ad that matches the look and feel of the publications where it is presented. The partnership means mediasmart’s customers are now offered in-feed native inventory across premium international and local language publishers in app, desktop, and mobile web. Wavemaker has announced that Candice Odhams will join the London office as managing director from 5 November. Her role at Wavemaker will be focused on leading and supporting the agency’s clients through ongoing digital and data transformation. Candice joins from GroupM, where she has worked for over five years, most recently in the role of managing director, global client solutions at the Performance Media Group and previously as VP, global client strategy at Xaxis. She brings a wealth of experience to the role, having worked alongside many of GroupM and WPP’s largest global clients, delivering strategic and innovative solutions across international markets, specifically in the areas of programmatic, e-commerce, and addressable TV. 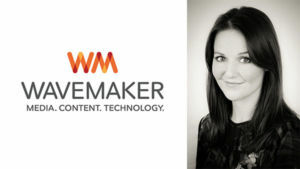 Anna Hickey was previously MD at Wavemaker UK before being promoted to COO in April 2018. Australia-based marketing technology company Simple has opened a London office and announced its EMEA management team a month after an investment round worth AUD$17m (£9.16m) to expand its Intelligent Marketing Platform globally. Simple, whose marketing resource management platform is powered by Microsoft, is moving quickly to establish its brand in the EMEA market, expanding its existing footprint in Australasia and the United States. Simple’s customer base includes a number of blue-chip brands in the financial services, retail, entertainment, and gaming sectors, including Westpac Group. “The combination of Simple’s experience in marketing and Microsoft’s technology stack will redefine the marketing execution landscape”, Mr Jarrett said. “Our new capability will enable organisations to rapidly integrate marketing data from multiple sources to generate insights and improve marketing performance without losing sight of the value of creativity. Also joining Simple’s EMEA team is sales director Mike Brothers, who was previously vice-president at Intellectsoft, and has worked with a number of startups in leading-edge technologies including martech, blockchain, and IoT.